Two black plastic suitcases, filled with 90 blocks each containing US$100,000 in notes, with combination locks, were seized, as well as two pieces of hand luggage also containing US currency, according to City Press. The Israeli national, Eyal Mesika, had the combination to open the locks. Mr. Oritsejafor, a close ally of President Goodluck Jonathan, said the plane had been leased to a third party and he could not be blamed for its schedules. The Nigerian government later admitted it was behind the arms deal, claiming it acted out of desperation for arms to defeat extremist sect, Boko Haram. An investigation planned by the Senate into the transaction has yet to begin while the House of Representatives threw out a motion seeking a probe. The South African newspaper, City Press, said documents in its possession show that the first consignment was personally signed off by the National Security Adviser, Sambo Dasuki, who issued the end-user certificate for the transaction. 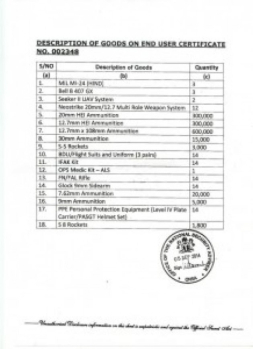 An entire “shopping list” was supplied with the certificate, which included everything from helicopters to unmanned aircraft, rockets and ammunition, it said. The latest transaction, according to the paper, was between Cerberus Risk Solutions, an arms broker in Cape Town, and Societe D’Equipments Internationaux, said to be a Nigerian company based in Abuja. The paper said the deal fell apart after Cerberus which had earlier received from Nigeria R60 million (N1.02 billion) in its account at Standard Bank, tried to repay the money as it it could not resolve its registration formalities with the South African authorities. “Cerberus was previously registered as a broker with the National Conventional Arms Control Committee (NCACC), but the registration expired in May this year,” City Press said. “The marketing and contracting permits also expired at the same time. The company has since applied for re-registration, but the application lay in the NCACC’s mailbox for more than two months. “Sources told Rapport that Cerberus apparently tried to pay the money back to the Nigerian company, after which the bank became suspicious,” the paper reported. The paper added that while the NPA’s Asset Forfeiture Unit subsequently obtained a court order in the South Gauteng High Court to seize the money, the NPA spokesperson Nathi Mncube, said there were no indications the two transactions were related.